Ok I have a juvenile veiled chameleon, Dexter. He’s approximately 4-5 months old. I’ve hear so many different things about when he should get his nutrients. The only constant is calcium with D3 every 2 weeks. Some research I’ve done and things I’ve read say vitamins and cal without D3 everyday but others say only a dozen crickets with calcium without D3 a week. I know to much of any of these can be harmful and potentially overdose him. So vitamins and calcium without D3 everyday or just vitamins everyday and calcium without d3 on a dozen crickets a week? Please help! I want to make sure Dexter is healthy and happy. His skin looks good, he poops good, he eats good and is very active in his home. So even the multivitamin every 2 weeks as opposed to everyday? See what I’ve seen states the the vitamin should be everyday for juvies but once they’re established every other day. This is and has been my dilemma! So much different information all the time! Thank you for the link tho Beman I’ll definitely check it out! Much appreciated! Well what are you using because this will matter too. Like I use Arcadia brand supplements. The vitamin I use is recommended on every feeding then the calcium magnesium without D3 is used on every 4th feed. So mine are different then the normal ones you can get at the pet stores. with vitamins this is where proper gutloading comes in to play with your feeders. I bought a chameleon kit for my daughter for Christmas. This came with a “zoo meds” multivitamin that states on the instructions for insectivores to apply every feeding for juveniles and every other for established ones. 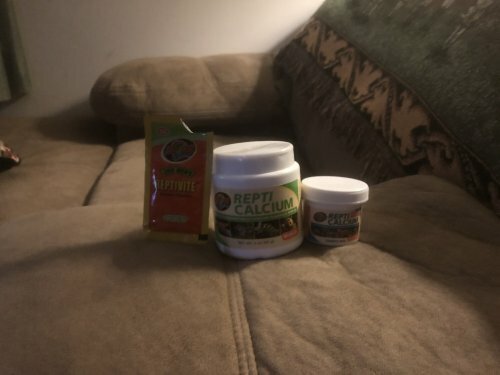 I bought zoo med calcium supplements that say 12 crickets per week dusted with each supplement. This is just crazy. I’m told and read so many different things about what to give Dexter, how much to give Dexter and when to give these things to Dexter. I don’t want to o d him nor deprive him of what he needs to be happy and healthy. Do me a favor and take pics of the supplements so we can give proper feedback on the exact ones you are using. What type of lighting are you using? Is it the double dome with heat bulb and compact bulb? One more thing. How can I determine how old he is based on his size? He’s already shed twice since I got him the day after Christmas. From his nose to the beginning of his tail he’s approximately 5 inches. Yes double dome with both of those bulbs. Ok since this is the case... I am going to suggest you fill out this form as well. We will need to talk lighting. @Brodybreaux25 which do you prefer for vitamins and calcium for a young veiled? I use Arcadia so I can not recommend. Based on size. I would say roughly 5-6 months if he is at about 5 inches and eats really well. And are you sure it is a boy? Does he have a tarsal spur on his hind feet? LOL ohhh hun it happened to me too. I bought $400 worth of useless stuff. Then had to replace everything. The people that work in petstores are not knowledgable enough to really give the right info. They sell a kit and some feeders and say your good when in fact your far from it. Your cage will be too small for him as well as he matures. He needs a minimum of 2feetx2feetx 4feet tall. Lighting should be upgraded asap. You need a T5 or T8 linear uvb bulb 5.0. This is extremely important so he does not develop MBD. I tagged Brody in this thread because I am not familar with your supplements. He is really knowledgeable about basically everything lol. This is the only supplement you need. If you have T5 lighting, this will cover your calcium, vitamin, and D3 needs. Simply dust every feeder with this.